Ahhhh...the Mosin Nagant, one of the most fun rifles to shoot in the opinion of the author. It’s just so...Russian. Long, bulky, and lacking the refinements found in western rifles but it is hard to argue the staying power of the design with nearly 40 million having been produced since its inception. The Bear line of ammunition are produced by the Barnaul Cartridge Plant in Russia. They produce several different variants of the basic steel-cased ammo that we have all come to know and love from Mother Russia. The Silver Bear line of ammunition uses the same steel case but electroplates the cases with zinc. This is the second highest grade of Bear ammunition, falling below the gold-plated Golden Bear, but above the lacquer coated Brown Bear line. Mosins, like all of its Soviet brethren, are not picky about ammunition. This is doubly true since it is a very hardy bolt-action; it just eats up anything you put in it and usually delivers with a surprising level of accuracy. The zinc coated Silver Bear cycles perfectly, and the 174 grain FMJ is one of two common weights in the 7.62x54R chambering. It is really tough to get much information in terms of ballistics from the Russian manufacturers, and Barnaul is no different. 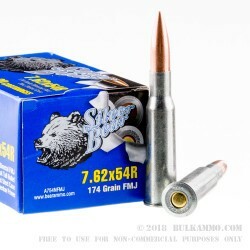 Silver Bear 7.62x54R with 174 grain FMJ specifications are not listed, but going off of Winchester 180 grain soft point you can probably expect about 2,625fps and 2,750 ft. lbs at the muzzle, so comparable to the .308 Winchester. Had to reset sights to Z ..0...just to hit 150yards.. I could hit Pepsi cans at 150 yards I think I still could set up for 500 yards.. I haven't tried more yardage...This rifle and ammo is capable of 300-400 yards..
Q: This is a non-corrosive ammo right? A: Hello, Yes, these 174gr. 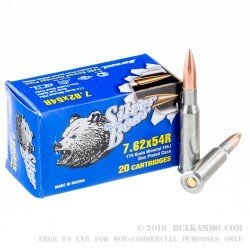 FMJ rounds by Silver Bear in 7.62x54R are non-corrosive. They make great target rounds for your 7.62x54R rifle. Q: is this a stell ammo? A: Hello, These 174gr. 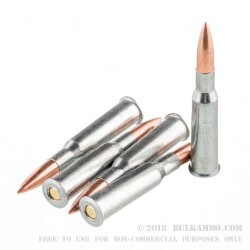 FMJ rounds in 7.62x54R have a lead core, but they do sometimes have a bi-metal jacket and they do have a steel case, so these rounds will attract a magnet. 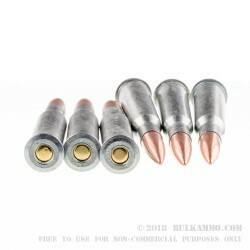 For non-magnetic rounds, I would suggest a brass cased round.